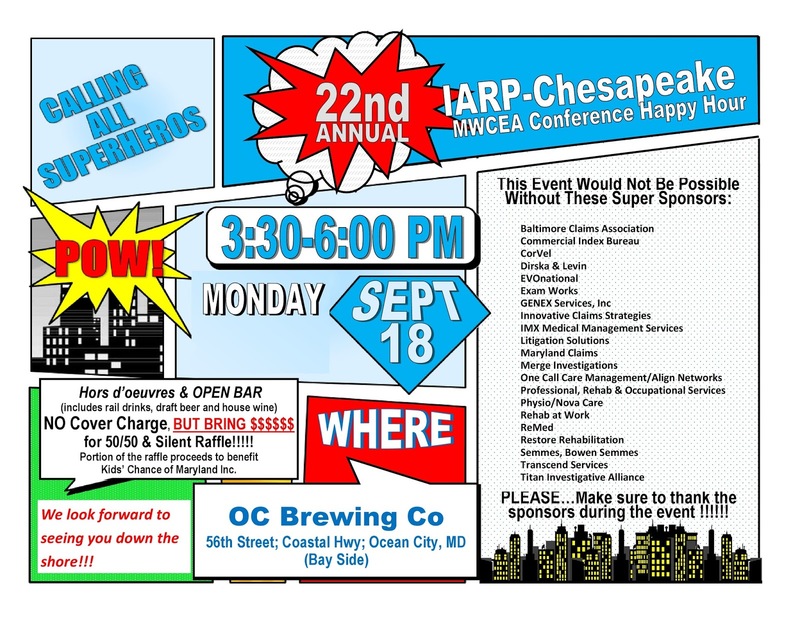 Injured Worker Help Desk: Join Us at this year's MWCEA Happy Hour Sponsored by "CARPPS"
Join Us at this year's MWCEA Happy Hour Sponsored by "CARPPS"
is sponsoring the largest happy hour at the conference again this year! We contributed to the IARP provided gifts for the raffles as well - we know you will enjoy every minute and hope you win something awesome.The best Happy Hour at the OC MWCEA Conference 9/18/2017 at OC Brewing Co.56th St. Coastal Highway 3:30 to 6:00 pm. Why not join us? If you are not already connected with me on LinkedIn, please send me an invite! https://www.linkedin.com/in/marysevinsky , company page follow our Maryland Workers Comp Page or our Vocational Rehab Page. Resources for Injured Workers and Professionals who work with them can be found on The Injured Workers Help Desk. Have fun and be safe - let me know if there is anything we can do to help at any time!